This article, which is part of the series on Linux device drivers, deals with the various concepts related to character drivers and their implementation. With that, she took out the first driver’s code, and pulled out various reference books, to start writing a character driver on her own. She also downloaded the online book, Linux Device Drivers by Jonathan Corbet, Alessandro Rubini, and Greg Kroah-Hartman. Here is the summary of what she learnt. We already know what drivers are, and why we need them. What is so special about character drivers? If we write drivers for byte-oriented operations (or, in C lingo, character-oriented operations), then we refer to them as character drivers. Since the majority of devices are byte-oriented, the majority of device drivers are character device drivers. Take, for example, serial drivers, audio drivers, video drivers, camera drivers, and basic I/O drivers. In fact, all device drivers that are neither storage nor network device drivers are some type of a character driver. Let’s look into the commonalities of these character drivers, and how Shweta wrote one of them. 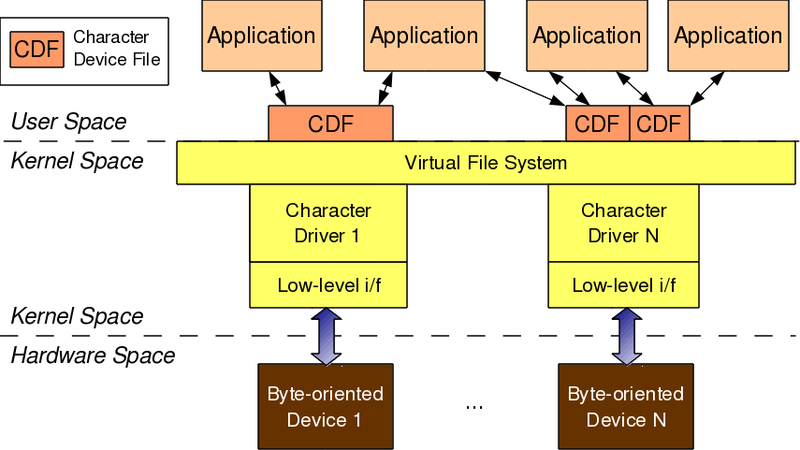 As shown in Figure 1, for any user-space application to operate on a byte-oriented device (in hardware space), it should use the corresponding character device driver (in kernel space). Character driver usage is done through the corresponding character device file(s), linked to it through the virtual file system (VFS). What this means is that an application does the usual file operations on the character device file. Those operations are translated to the corresponding functions in the linked character device driver by the VFS. Those functions then do the final low-level access to the actual device to achieve the desired results. Note that though the application does the usual file operations, their outcome may not be the usual ones. Rather, they would be as driven by the corresponding functions in the device driver. For example, a write followed by a read may not fetch what has just been written to the character device file, unlike for regular files. Remember that this is the usual expected behaviour for device files. Let’s take an audio device file as an example. What we write into it is the audio data we want to play back, say through a speaker. However, the read would get us audio data that we are recording, say through a microphone. The recorded data need not be the played-back data. Registering for the <major, minor> range of device files. 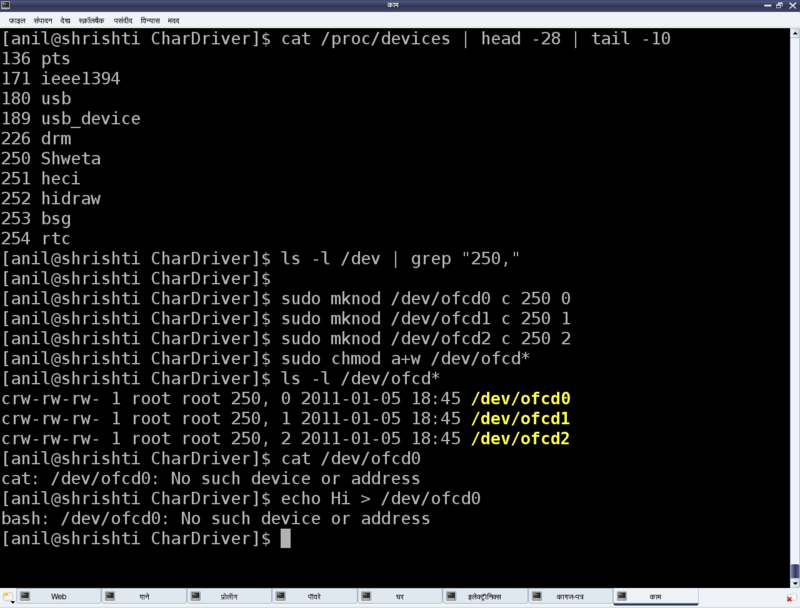 Linking the device file operations to the device driver functions.